or sneaking bits of cookie dough before the cookies went in the oven. For some reason, it always tasted better than the end product. but my sister is still in love with all things cake batter or cookie dough. In fact, she'd probably prefer I didn't bake anything. On New Years day I found myself needing a dessert recipe. My dilemma? Well, I had two. The first was that whatever I wanted to make had to be made with the ingredients on hand as the shops were closed. The second was that it was way too hot to turn the oven on. and a google search led me to Love and Olive Oil where I found the recipe for these Cookie Dough Truffles. and even better? I had all the ingredients on hand! Before I knew it I was rolling balls of cookie dough and putting them in the freezer to chill. These were alot simpler than I thought they'd be, in a few hours I had three trays of truffles. 50 something bite sized truffles in fact! Cream butter and sugars with an electric mixer until light and fluffy, add milk and vanilla and mix until incorporated. Gradually add in flour, baking soda and salt and mix until incorporated. Cover bowl with plastic wrap and chill in the fridge for an hour or until firm enough to handle. Form dough into small balls and arrange onto baking sheets lined with baking/waxed paper. Place sheets in the freezer and chill for 30 minutes until the balls have hardened. 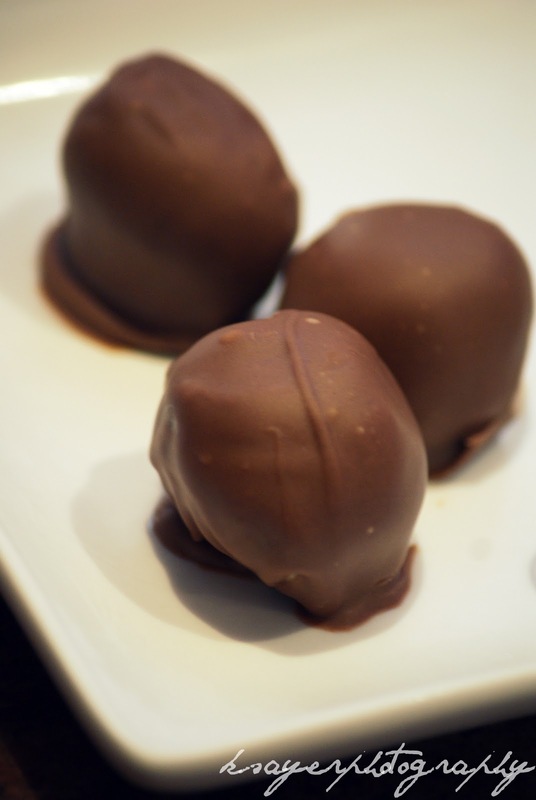 Melt chocolate/candy coating in a double boiler or in the microwave. Using forks, dip cookie balls into chocolate to cover, letting any excess drip off before returning to the lined baking sheets. 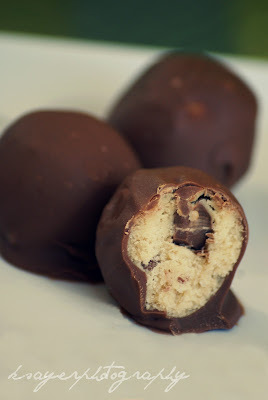 These cookie dough truffles were a huge hit and perfect for a hot summers day! I will definitely be trying out different combinations in the future, you could take your favourite cookie and turn it into a fancified treat! I love ANZAC cookie dough - so I'm wondering whether they would make a good cookie dough truffle innard! and do you like eating cookie dough/cake batter? my favorite summer dessert.. not sure, I made an awesome mangomisu last year, need an excuse to make it again! was delicious! If it tastes good, it's good - no? Summer fruits are made for desserts! I definitely like baked cookies more now! Especially ginger cookies - spiced cookie dough isn't too nice raw.